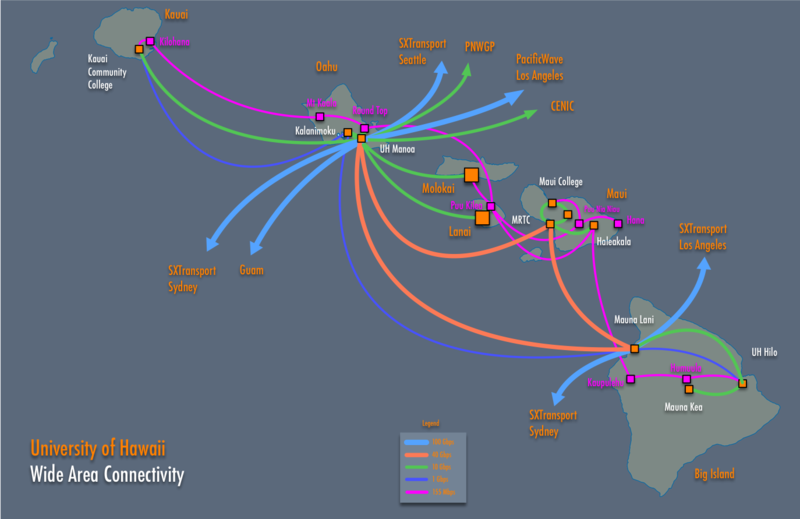 The Office of Technology Infrastructure (TI) implements, operates and supports a wide range of technical infrastructure for the University of Hawaiʻi (UH). This infrastructure broadly impacts all aspects of University life including key business systems, classroom learning tools and research activities. System Services: The System Services team supports a wide range of technical components including databases, servers, operating systems, utilities, middleware and security technologies. These technical components are a part of the underlying infrastructure of the University’s key business systems and services. Network Engineering: The Network Engineering group is responsible for the design, planning and implementation of network connectivity within the UH system and all its campuses, educational centers and research sites, as well as to the Internet, national and international research and education networks, and state and local government networks. Operations: The Operations unit provides a wide-range of day-to-day support services to maximize the availability of the University’s networks and key business systems. In addition, this group is responsible for the operations of the Information Technology Services’ Data Centers and the systemwide voice service.